Sewing Baskets - Organize Yourself And Sew More Efficiently! Sewing baskets are so useful for keeping all your basic sewing materials together. It is great to have one handy at home or even at the office. It can be portable - perfect for taking along on a trip or to the cottage to have handy for all those creative sewing projects. There are many types of baskets available, ranging from small easy to carry portable baskets of various sizes to freestanding units with drawers. As well as being useful, baskets can be charming and beautiful as well. You might even pick a fabric covered one to coordinate with the decor of a certain room! Sewing baskets can be as detailed as you can imagine them to be. 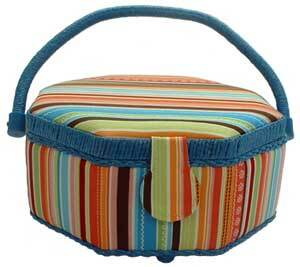 A sewing basket makes a great personal gift. Even for a person who doesn't sew often, it is handy to be able to grab that little basket to sew on a button or fix a seam. No more hunting through the house for what you need! Your basket does not have to be expensive, flashy or fancy. Its purpose is for organizing your sewing tools and supplies. Some people find a simple fishing tackle box works well with all its tiny compartments - easy for organizing! Where Could You Buy Your Sewing Basket? Visit your local Craft or fabric stores. They will have a selection to look over. You will find larger choices available at some of the national chain stores. 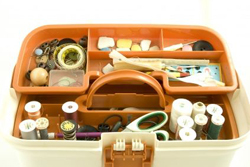 What Should You Keep In Your Sewing Kit? Here's a couple of ideas for a basic sewing kit. Of course, if you do other forms of needlework or you will want to include your specific tools as well. Threads of various colors and weights - You could buy prepackaged assorted thread kits ready to go. Assortment of Hand Needles - Get a variety pack consisting of many sizes. Liquid Ravel Preventer - Apply this clear liquid to the raw edge of a fabric and prevent further fraying. The brand I have is called "Fray Check" It stiffens when dried and withstands laundering. "Stitch Witchery" or a similar product. It is an iron-on, glue-bond strip used to fuse two pieces of fabric together.